Alternative energy is getting multi-million-dollar exposure in the country’s most widely viewed television event, the Super Bowl. Anheuser-Busch, one of the world’s leading beer makers, has invested about $7.5 million on a 45-second Super Bowl commercial touting wind power’s renewable resource use, which could affect Indiana. The spot, named “Wind Never Felt Better,” is one of eight commercials Anheuser-Busch will air during Super Bowl LIII, Feb. 3. Anheuser-Busch's 45-second Super Bowl ad named "Wind Never Felt Better" showcases the company's commitment to wind power. Anheuser-Busch says by 2025 it plans to reduce carbon dioxide emissions across its value chain by 25 percent to make sure 100 percent of its purchased electricity comes from renewable resources. That’s where Anheuser-Busch’s Super Bowl investment could pay off for Indiana. A major corporation’s visible commitment to wind power could spur more interest and investment. Currently, there are 15 active wind power manufacturing facilities in the state that employ about 3,000 workers. Wind power production in Indiana is up. Indiana has an installed wind power capacity of 2,117 MW, or enough energy to power about half a million homes, but produces only about 5 percent of the energy used in the state. In 2017, Indiana was powered mostly by coal and natural gas, which make up nearly 75 percent and 19 percent of the state’s installed capacity respectively. Most of the state’s wind power is sold to other markets with higher electricity costs. Indiana’s wind farms already provide energy for two of the country’s largest corporations. Wind from EDP Renewable’s Headwaters I Wind Farm in Randolph County provides energy to Facebook’s New Albany Data Center in Ohio and retail giant Walmart. EDP Renewables says it will build a new 200 MW wind farm to keep up with demand. Wind farms in Randolph County, Indiana provide energy for Facebook and Walmart. Courtesy: White Construction Inc. But not everyone agrees wind farms positively affect the Hoosier state. Indiana Wind Watch, a group that opposes wind energy projects in Indiana says the Anheuser-Busch commercial is spreading a false narrative about the realities of wind energy. “Missing from Anheuser-Busch's commercial is the reality that wind turbines are very often irresponsibly-sited close to homes,” Indiana Wind Watch told the Indiana Environmental Reporter. “Where are the pictures of the homes being encroached upon by industrial wind turbines? Also missing is the power plant, usually a fossil-fueled gas plant, that is used for back-up power when the wind turbines are not producing electricity. 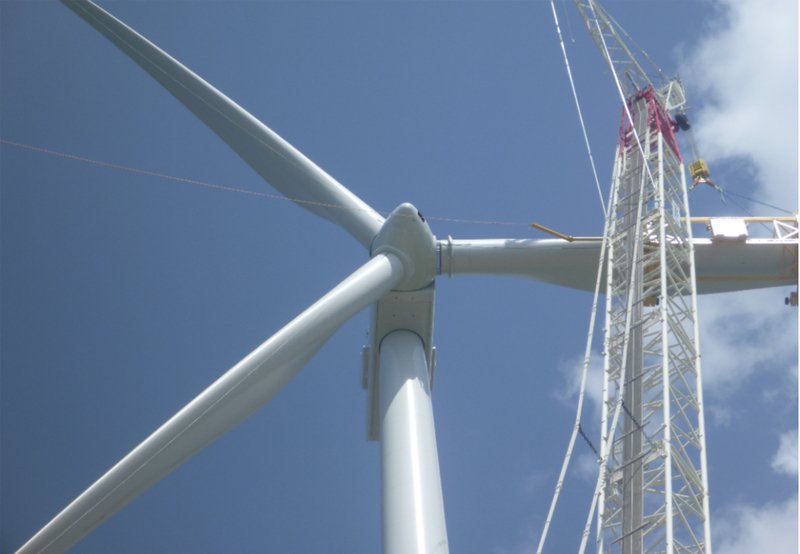 Groups like Indiana Wind Watch oppose the construction of wind farms in the state. Wind energy suppliers do receive tax subsidies, but support and subsidies have fallen 80 percent in the last three recorded years. In 2016, the most recent data available, wind projects in the U.S. received $1.27 billion in support and subsidies, slightly more than the $1.26 billion the coal industry received that year. Wind energy opponents have used property rights and noise complaints to defeat wind projects here in Indiana, but the state remains twelfth in the nation for wind power production. Clean energy development in rural parts of the Midwest has been proven to create jobs and support local infrastructure development. As of 2018, 10,683 people were employed by the renewable energy industry in Indiana. Building renewable resources has also proven to be cheaper than maintaining existing coal plants. Northern Indiana Public Service Co. analysts found that NIPSCO would save $4 billion over 30 years by reducing its coal usage to 15 percent in 2023 and would completely stop burning coal by 2028. Vectren Corp. announced a 60 percent carbon emission reduction by 2024 that would include the closure of three coal-powered plants in southwestern Indiana and an increased reliance on renewable energy sources. Indianapolis Power & Light, Duke Energy, Indiana Michigan Power and Indiana Municipal Power Agency have all invested in renewable energy efforts in some capacity.